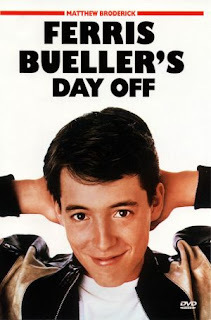 Essential plot rundown: The most popular kid in school calls in sick in order to hang out with his friends. This is a funny movie. A little crude, but funny. The humor in this was well written. I was laughing the whole time and none of the jokes really felt forced. I especially liked the secretary (played by Edie McClurg). She was superb. I felt all the actors did good in their roles. However, I have mixed feelings about Bueller. He's kind of a jerk. He essentially bullies his friend into hanging out with him. He had good intentions, he just went about them in the wrong way. I liked the themes that were presented. 1) Enjoying life and 2) Standing up for yourself. 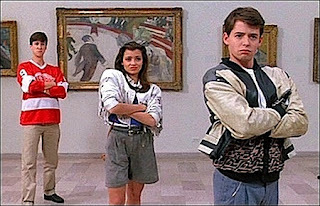 At the beginning and end, Bueller says: "Life moves pretty fast. If you don't stop and look around once in a while, you could miss it", which I personally think is true. It was also cool to see (well, you never actually see it) Cameron stand up for himself. He makes some comment about not letting things unfold anymore that will determine his life but how he's taking charge. I thought it was a nice little scene. Overall, a pretty funny show. It has good acting and some other good stuff. It's 2 o'clock in the AM and I'm really tired.